It is difficult to write about all the eternal dividends of Toccoa Falls because there are so many. . . . Scores of letters thrilled the hearts of Dr. and Mrs. Forrest. As they read the mail, phrases like “How sweet!” “Isn’t this lovely?” and “Praise the Lord!” were often repeated. Hundreds of testimonies praised the work of Toccoa Falls. Homecoming days were a paean of praise as hearts rejoiced for what the Lord had accomplished through His servants. Only a few are presented here. Practically every person who came as a student claimed to be a Christian, but in many cases, this only meant he or she was a church member. Each year scores of students came to know Christ in a real and vital way, and many were called into definite, full-time service. One high school boy from Jacksonville, Florida, gave the following testimony: “I came to this school unsaved, but am now saved and rejoicing in the Lord. At Toccoa Falls Institute, I was taught to believe on the Lord. So, I can truthfully say that if it were not for this school I would still be in sin and unsaved.” A girl from Illinois testified: “TFI is my ‘spiritual home’ for it was there in 1941, I found Christ and His salvation so full and free.” Similar statements were made by dozens of young people before the end of each school term. The Bible College students traveled approximately three thousand miles a month in order to reach about 2,500 children a week in services at schools, as well as an uncounted number of adults in street meetings, jail services, church services, visitation work, and other types of contacts. On one Sunday morning, every pulpit in Stephens County was supplied by one of the faculty or student body of Toccoa Falls. 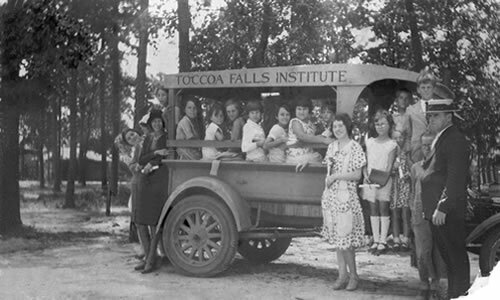 Editor’s note: Shown in the photo above is the Toccoa Falls Institute Gospel Car.